Whether you recently bought a new iPhone XS or iPhone XS Max, or you’re preordering the hot new iPhone XR that just went up for pre-sale on Friday, you need a wireless charger. Trust us, it makes life so much easier. But not all wireless chargers are created equal and the good ones are often quite expensive. Our favorite model is the RAVPower HyperAir Fast Wireless Charger, which originally launched at $50. 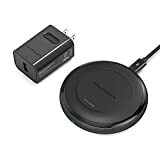 The price has since dropped to $40, which is a fantastic price for a reliable fast wireless charger made of sturdy aluminum instead of cheap plastic like rival models. But if you use the coupon code JVTZG3SQ at checkout, you’ll only pay $19.99!